If Anusree Roy were not listed in the programme as the author of Little Pretty and The Exceptional, I never would have guessed she had written it. Unlike such powerful plays of Roy’s as Pyaasa (2007) and Letters to My Grandma (2009), Little Pretty is ill-conceived and ineffective. It unconvincingly tries to mix sitcom-like laughs with poorly explored scenes of mental illness. For two hours it vacillates between the two modes until it simply stops without a conclusion leaving us unenlightened both about the characters and their situation. The basic situation is uncomplicated. Dilpreet (Sugith Varughese) hopes to fulfil a life-long dream of opening a sari shop in the Little India section of Toronto on Gerrard Street East. His plan is to open it on Canada Day. 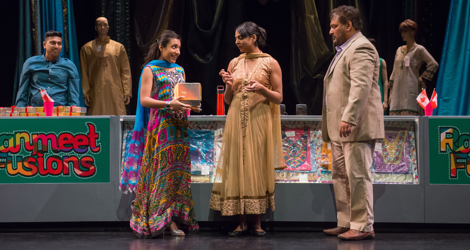 To do this he needs the help of his two daughters – Simran (Farah Merani), the elder, and Jasmeet (Shruti Kothari), the younger. As the three ready themselves for the opening, two side plots emerge, one comic, one serious. In the comic plot Jasmeet works hard to make Dilpreet approve of her Tamil boyfriend Iyar (Shelly Antony). Dilpreet says she doesn’t like Iyar because he is too “black”. When told he is racist, he answers,”How can I be racists against my own race?” If Roy wanted to explore the subject, which she apparently does not, there is such a thing as bias according to colour within races which is called “colourism” or sometimes “shadeism”. The serious plot involving Simran has to do with her anxiety at passing the LSAT test because she wants to get into Osgoode. She exhibits fidgeting with her fingers and neck. After she fails to get into the percentile needed to get into Osgoode, her mental state deteriorates beyond anxiety into mental illness. Dilpreet’s wife, the mother of his two daughters, went insane and committed suicide. A main failing of the play is that Roy never tells us why this occurred or how the family coped with it beyond making it a taboo topic of conversation. Jasmeet is shocked that Simran would use a photo of their mother as her screensaver. Later, when Simran goes missing, Jasmeet knows that she must have gone to look at the tree where their mother hanged herself. Since Roy has made Jasmeet the most rational of the three, it is not at all believable that it should be Jasmeet who insists Simran is fine and tells her father not to take Jasmeet to see a specialist that Simran has seen before. Roy needs this bizarre shift in Jasmeet’s character because she wants to show Simran’s condition deteriorate even further to the point of hallucinations and worse and to make us worry how Simran’s condition will affect the store’s opening. Roy has Jasmeet make the claim that hallucinations are normal for people with anxiety which is both false and foolish given what Simran has already done. Eventually, after Simran has a fit that Jasmeet and Dilpreet observe, Jasmeet admits her error and finally takes Simran to the hospital. Simran is out four days later in time for the opening. Roy’s would-be chilling ending is that Simran complains about the lights in the store being too bright, a complaint she made early in the play. Anyone who knows about anxiety disorder, clinical depression or obsessive-compulsive behaviour should know that no short stay in the hospital will cure such conditions. One of the many frustrations of anti-depressants is that it can take up to six months before they have any noticeable effect. Simran’s recurrence to an older thought only four days after treatment is too soon even to be called a relapse which is what Roy wants it to be. Roy gives Simran such a wide array of symptoms, including the literary notion that mad people laugh for no reason, that it is difficult to know what mental illness she is depicting. In the play she does not give us Simran’s diagnosis nor that of Simran’s mother. Only by reading the Playwright’s Notes in the programme do we learn that both suffer from schizophrenia. If that is true, why not tell us so in the play to help us make sense of Simran’s otherwise inexplicable behaviour? tiresome after the third repetition. Like Choi’s Kim, Roy’s Dilpreet heartily disapproves of the modern ways of his hip Canadian-born daughter. Thus, in the midst of a typical comic generational clash of values sits Simran’s descent into schizophrenia. Yet, even here Roy shows us Simran only from the outside. All we see are an accumulation of worsening external physical symptoms without allowing Simran to speak to anyone about what is happening. Roy includes one non-naturalistic scene when Dilpreet, Jasmeet and Iyar take photos including an absent Simran while we see Simran walking aimlessly about the set. Why not give Simran monologues so we can get a better understanding of how her thinking has been disturbed? Just as it is surprising to see Anusree Roy’s name attached to the play it is surprising to see Brendan Healy listed as director. His virtue always was his clear insight in how to stage difficult plays. Roy’s play, however, remains superficial throughout, so Healy has little to do. Having composer Richard Feren accompany Simran’s scenes of madness with doom-laden chords is not incisive but heavy-handed. Given all these difficulties, the actors acquit themselves well. Sugith Varughese is very funny as the would-be stern Dilpreet, who confronted with Jasmeet’s wiles turns out to be a pushover. His most powerful scene is his prayer to the gods to bring Simran, his “golden” child, back to him. Shruti Kothari is also amusing as the know-it-all young person exasperated by her father’s old-fashioned way of seeing the world, yet she knows how to manipulate him to get what she wants. Most of her humour derives from her complacent egocentricity. Shelly Antony as Iyar has little to do but appear so sincere, enthusiastic and eager to please that Dilpreet’s bias against him naturally fades away. Farah Merani has the difficult role of Simran. She establishes the young woman’s anxiety and emotional volatility early on, but Roy has forced Simran’s descent into madness to be so rapid that Merani can do little to make it believable. 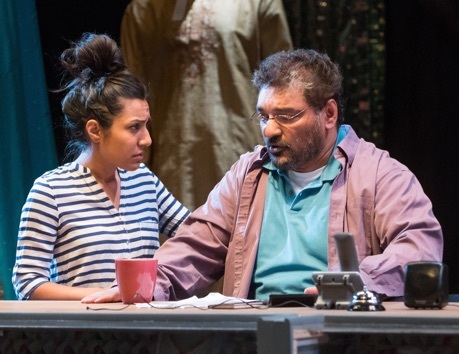 It is quite disheartening to engage with a play for two hours and emerge knowing virtually nothing about the main characters except clichés about immigrant families and about mental illness. Roy’s previous plays have been so much richer and filled with tragic irony. Here the attempt to be light-hearted and serious at once simply doesn’t work. Let’s hope Roy returns to her passionate and compelling best in her next play. Photo: Shelly Antony, Shruti Kothari, Farah Merani and Sugith Varughese. Shruti Kothari and Sugith Varughese; Farah Merani. ©2017 Joseph Michael Photography.